In this 2008 file photo Xavier’s Dante Jackson gives a thumbs up to the crowd in Puerto Rico where the Musketeers beat the Virginia Tech Hokies. Jackson was hired as an assistant coach on Wednesday by the Musketeers returning to Xavier four years after departing the school after three years as a graduate assistant. 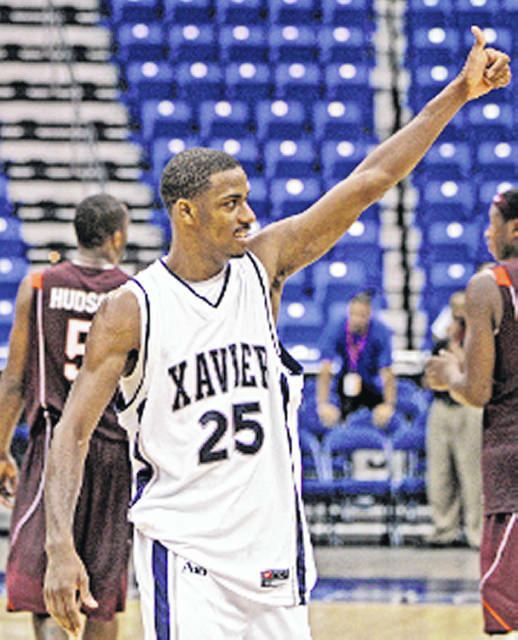 Xavier University first-year head coach Travis Steele has hired Xavier graduate and former Musketeer basketball standout Dante Jackson as an assistant coach. Jackson, who was a graduate assistant coach on the Xavier staff from 2012-14, won 107 games and played in four NCAA Tournaments as a Musketeer player, including an Elite Eight and two Sweet 16s. Jackson, 30, returns to Xavier after gaining experience as a full-time assistant at nearby Northern Kentucky (2015-16), Air Force (2016-17), Robert Morris (2017-18) and a brief stint at Kent State before agreeing to return to his alma mater. Prior to his graduate assistant stop at Xavier, Jackson started his collegiate coaching career as a graduate assistant for one season (2011-12) under then-Ohio University head coach John Groce, the brother of Xavier’s head coach. The Bobcats finished with an overall record of 29-8 that season, won the 2012 Mid-American Conference (MAC) Tournament title and advanced to the Sweet 16 of the 2012 NCAA Tournament. Jackson, a native of Greenfield, Ohio, is a 2011 graduate of Xavier University with a bachelor of arts degree in liberal arts. He earned his master’s degree in sport administration from Xavier in 2014. The Musketeers finished in third place in their first season as a member of the BIG EAST with an overall record of 21-13 in the 2013-14 season, including a 10-8 conference mark, and earned an at-large berth to the 2014 NCAA Tournament in Jackson’s final season as a graduate assistant. Jackson concluded his playing career with the Musketeers with 107 victories, including seven in the NCAA Tournament. The 107 wins are just one shy of the school record held by Jason Love. A three-year starter at Xavier, he posted career totals of 795 points, 374 rebounds and 255 assists. Jackson shared the school record for games played with 137 until 2018 graduates Trevon Bluiett and J.P. Macura took over the top two spots this past season. Jackson appeared in the NCAA Tournament in each of his four years as a player, including an Elite Eight appearance in 2008, the Sweet 16 in both 2009 and 2010 and the second round in 2011. As a prep at McClain High School in Greenfield, Ohio, Jackson finished as the program’s all-time leading scorer with 2,423 points and also set career program marks for rebounds (1,014), assists (502) and steals (312). McClain posted a composite record of 85-12 during Jackson’s four seasons on the roster, including three South Central Ohio League championships, four sectional titles and two district championships. Tom Eiser is the Associate Athletic Director for Communications at Xavier University. https://www.timesgazette.com/wp-content/uploads/sites/33/2018/07/web1_Dante-pic.jpgIn this 2008 file photo Xavier’s Dante Jackson gives a thumbs up to the crowd in Puerto Rico where the Musketeers beat the Virginia Tech Hokies. Jackson was hired as an assistant coach on Wednesday by the Musketeers returning to Xavier four years after departing the school after three years as a graduate assistant.